The first panel was comprised of Martin Berg, longtime journalist and the editor of Where’sOurMoney.org, Carlos Marroquin, a foreclosure activist with Occupy LA, and Peter Kuhns, an organizer with ACCE, the Alliance of Californians for Community Empowerment. The panel addressed the questions that many people ask about the foreclosure crisis: Isn’t it the fault of people who just bought too much house and couldn’t pay for it? Why should we pick up the tab for people who couldn’t pay the debts that they had accumulated. In answering this question the panelists talked about the seeds of the foreclosure crisis in the predatory lending practices of the previous decades which overwhelmingly targeted communities of color and low income people. They also discussed the barriers that the banks were putting up so that people who qualified to modify their loans were not getting the loan modifications they should be getting. Finally they talked about the human stories, people who worked hard all their lives, who were caught up in a trap laid for them by banks who were out to make even more money, who were evicted from their homes. But they also talked about some stories of hope, in which the bankers, when forced into the light of day, agreed to modify loans and let people remain in their houses. The second panel was comprised of faith leaders who addressed the question of the response of the faith communities. 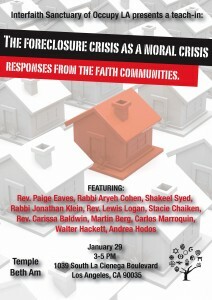 The panel was moderated by United Methodist Pastor Paige Eaves of Crescenta Valley United Methodist Church, and included Shakeel Syed, the Executive Director of the Islamic Shura Council of Southern California, Rabbi Jonathan Klein, the Executive Director of Clergy and Laity United for Economic Justice—Los Angeles (CLUE-LA), Rev. Peter Laarman, Executive Director of Progressive Christians Uniting, and your humble servant. 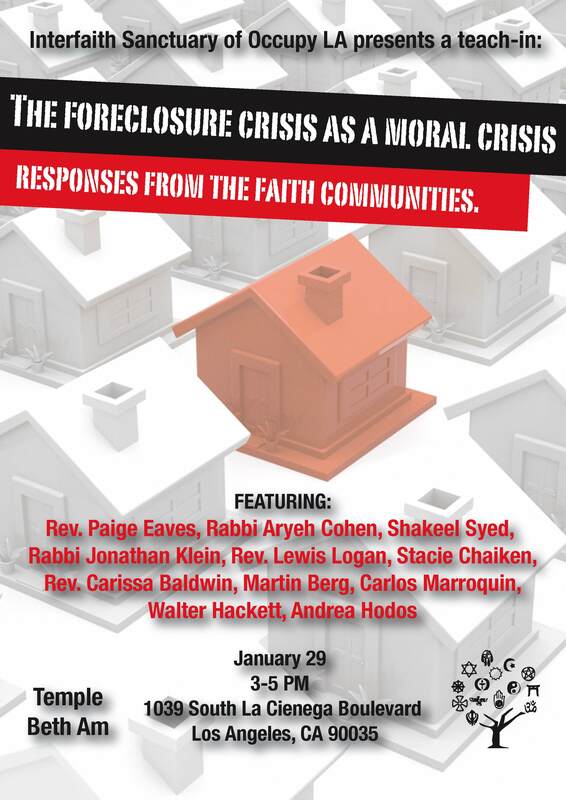 We discussed the religious issues that were raised by the foreclosure crisis, the issue of shame around foreclosures and ways to engage it both pastorally and politically, and issues of the market and materialism. The video of the second panel, is here. The teach was brought to a close by Andrea Hodos with a group movement performance that brought a lot of the themes of the day together. The video of Andrea’s piece is here. This entry was posted in community of obligation, foreclosure crisis, greed, Occupy LA by admin. Bookmark the permalink.